Although we concentrate a great deal on the overall look, makeup and design of the flooring discussed on this blog, there’s also a hidden extra that can go a long way to defining your carpet’s comfort factor: underlay. There are three basic factors when it comes to choosing underlay – and one slightly different factor unique to Harrisons. The first two regular features of underlay are its thickness and density (both of which determine how comfortable and “springy” your new carpet will feel), the third feature is its composition (for example, all of our underlay is made from 90% recycled materials and is, itself, recyclable, and some of our underlay has Microfresh antimicrobial protection which helps control mould, mildew, bacteria and dust mites around the home). 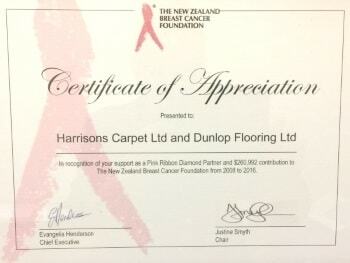 And the unique feature of our Invincible Underlay is that Harrisons and Dunlop Flooring Ltd donate a dollar for every roll we sell to The Breast Cancer Foundation of New Zealand. This is a great Kiwi cause and we are proud to be supporting them. Harrisons Carpet Ltd and Dunlop Flooring Ltd have now donated more than $250,000 to the organisation, which invests the money into research, awareness, education and support to fight an illness. So what are you looking for from a great underlay – also known as carpet cushion? Classic: Its density rating of 95 and 10mm thickness means – according to Harrisons carpet product manager Mike Dean – that this is “better than entry level” in terms of comfort with good quality materials and adds a level of insulation against heat loss and sound transference. Invincible: The combination of 11mm thickness and higher density really adds to the comfort factor. Mike says more than half of Harrisons Carpet sales go with Invincible underlay because people like the extra comfort underfoot particularly if they are buying a low profile lighter weight carpet. The anti-microbial treatment and the fact that every roll supports the New Zealand Beast Cancer Foundation also goes to making it “our biggest seller”. Gold Extreme: This is a very high density 11mm 120kg underlay, it has a little stiffer feel than the Invincible, a good option for high traffic situations or to give extra support for long piled luxurious carpets. Comfort: This is the key factor because your choice of underlay can also influence your choice of carpet – so make sure to discuss all options and how they will work with our carpet ranges with our Harrisons flooring experts. Insulation: For the ever-increasing number of Kiwis living in apartments, insulating against noise can be a major factor – while all New Zealanders understand the importance of insulating their homes as well as possible to prevent heat loss and provide economic, healthy living spaces. Composition: Those who suffer with allergies or who have children might want to insist on having Microfresh antimicrobial protection as an extra layer of defence against the mould and dust mites that can cause issues. 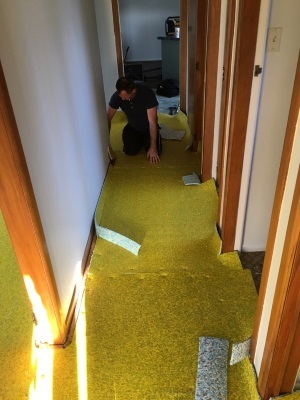 Extras: Being made in New Zealand to certified standards out of 90% recycled and recyclable materials should give you peace of mind – the fact that our underlay is guaranteed for the life of the carpet also means you’re spared the worry of thinking about replacing underlay before you want to change your carpet. Feel-good factor: For those who like to think their money is working as hard as possible both for themselves and other Kiwis, knowing that choosing Invincible Underlay from Harrisons guarantees a donation to the Beast Cancer Foundation of New Zealand can also be a factor in their choice. So if you are considering home renovation or you’re just looking at buying new carpet for a room in your house, it’s worth talking to a Harrisons Carpet expert about our underlay options. We can show you how the carpets perform alongside the three carpet cushion ranges during a free in-home consultation. Call us to book an appointment on 0800 421001, or fill out the booking form online.